Onion, Cheese, BBQ, Hot and Spicy, and Cheese and Onion. Potato chips are a relatively new culinary invention, they were first made by an American chef George Speck in 1853 in New York who had prepared a plate of French fries for a diner, who subsequently returned them complaining they were too thick, and the worst fries a chef could ever prepare. Deciding to teach the diner a lesson, Speck cut the fries too thin to be picked up with a fork, and had the thin fries delivered to the diner. Happily for us, but sadly for George Speck, the diner was delighted and soon the entire restaurant requested George’s new fries. By the turn of the century restaurants and pretzel companies all over America were selling salted potato chips as a snack food, and in the 1920s the mechanical potato peeler was invented, previously all potato chips had been peeled by hand. Sales of potato chips nationally only occurred in the 1930s, and after the second world war potato chips were as common as candy on grocery store shelves. European nations adopted the potato chip after being exposed to the recipe by US servicemen. In the 1960s an American named Alexander Liepa who was working for the US Army invented a potato chip that wasn’t peeled and cut, instead it was made from potato flakes and reconstituted into the shape of a chip. The idea had been to create a snack that could be made in remote US bases without the expense of transporting American grown potatoes from the US. Liepa’s technique wasn’t used by the US Army, and he was able to take his patent to Procter & Gamble in 1968, who readily supported his recipe, creating a product they initially named Pringle’s Newfangled Potato Chips. Workers from P&G have mentioned that the name Pringle’s, or just Pringles as they are now known, was picked for its similarity to a street named Pringle Street in Finneytown, Ohio, simply because the name sounded pleasing. P&G marketing staff believed that their sales team would have no trouble introducing Pringles because the name was easily pronounced and remembered. An urban myth suggests the name was picked randomly from a Cincinnati phone book, again for its pleasing sound, although this has never been proven. Producing Pringles required developing new machinery and techniques, and involves mixing potato flakes, rice flour, water, and other ingredients until a smooth dough is made, then cutting the dough into thin round pieces that are placed onto individual baking trays with the saddle shape pre-formed. The chips are then fried very quickly, in a machine invented by science fiction writer Gene Wolfe, just enough to cook but not enough to brown. Seasoning is added immediately after, before the Pringle chip is sent to a stacking machine that bundles several together for packing in the distinctive Pringles containers. 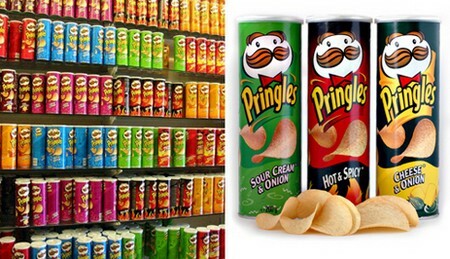 The can used to package Pringles chips had to be specially designed as well, Pringle chips are quite fragile, completely unlike regular potato chips that can be stored in paper or plastic bags, Pringles would crush and break too easily. The task of designing the container came to Fredric Baur who worked in the food storage department of P&G, plastics weren’t common in those days so Baur designed a foil lined can made by rolling lengths of cardboard into a cylindrical tube. The tube protected the chips which are stacked, thus adding preventing much breakage. The aluminum foil inside the can prevents outside air from entering the can and keeps the Pringles chips fresh longer, a fact that really appealed to the Baur who requested that some of his ashes be buried in a Pringles container. In March 2008 Baur passed away and his family honored his request, splitting a small part of his ashes and placing them in a Pringles can which were then interred alongside the remainder of his ashes. Whilst Pringles were initially only sold in selected regions close to Cincinnati, by 1976 the chips were being marketed nationally with an advertising slogan “Once you pop, you can’t stop”. 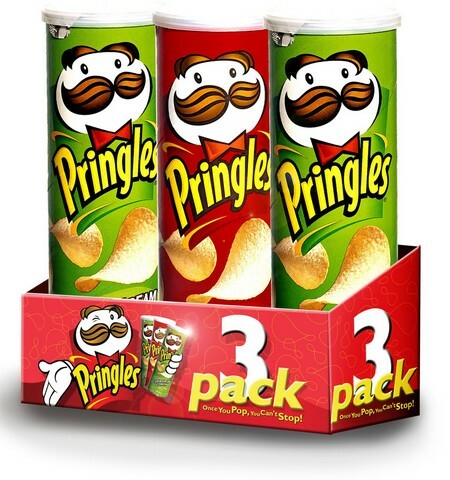 The pop in the slogan refers to the distinctive popping sound heard when a can of Pringles is first opened, and is caused by excess air in the canister that helps to keep the chips fresh. Owing to their potato and rice mixture, Pringles have a taste that is in some ways less harsh than regular potato chips, and market research by P&G suggested that this made Pringles a much easier chip to eat. In fact, the recipe for Pringles chips places the snack in a different tax category as regular chips, in 2008 a London court found in favor of P&G after the UK tax authorities imposed a 15% sales tax (VAT) on Pringles chips as they would do for any other potato derived product. P&G’s lawyers argued that Pringles are actually only comprised of 42% potato, the remainder being rice flour, and thus should be categorized as a food for tax purposes and be exempt from sales tax. The ruling had important repercussions since Pringles are priced higher than regular potato chips and the sales tax would have made the product uncompetitive. But could use a little bit more history.